1. User enters login and password. Cleartext user ID goes to Authentication Server (AS) with a request for services on behalf of the user. 2. AS checks if user login is in the database. If there is information about that user, then AS can generate the client secret key according to user’s ID and password. AS sends to the user:– Client/TSG session key (encrypted with client secret key); – TGT including user ID, network address and ticket validity period + Client/TGS session key (encrypted with TGS secret key). 3. User decodes the first message but can’t decode the second one, because the user doesn’t have TSG secret key. Client sends message to TGS: – TGT received from AS + Server ID + TGS/Client secret key (encrypted with TGS secret key); – Authenticator including client ID and timestamp (encrypted with Client/TSG session key). 4. TGS decrypts the first message, gets TGT + TGS/Client session key, with which it decrypts the second message. TGS checks if user ID from the first message matches the ID from the second message and whether the timestamp doesn’t exceed ticket validity period. In case everything is right, TSG sends to the user: – Used ID, network address, ticket validation period + Client/Server session key (encrypted with Server secret key); – Client/Server session key (encrypted with Client/TGS secret key). 5. Client sends the following to Server which it tries to get access to:– Used ID, network address, ticket validation period + Client/Server session key (encrypted with encrypted with Server secret key); – Authenticator including ID and timestamp (encrypted with Client/Server session key). The client checks whether the timestamp value is timestamp + 1, which shows true identity of a server. If it is so, the client can trust the server and start working with it. Create an Active Directory user (you can use an existing one instead). Log into the domain controller server, click Start → Administrative Tools, and launch Active Directory Users and Computers. If it is not already selected, click the node for your domain (domain.com). In the New Object → User dialog box specify the parameters of the new user. It could be a regular user, it is not required to provide the user with some additional privileges. User account should be active (The Account is disabled check box unchecked), and the password for the account should be perpetual (The Password never expires check-box checked). Assign principal names with encrypted keys on the domain controller machine. For machines on Linux, create a keytab file containing pairs of Kerberos principals and encrypted keys. A keytab file is used to authenticate to various remote systems using Kerberos without entering a password. 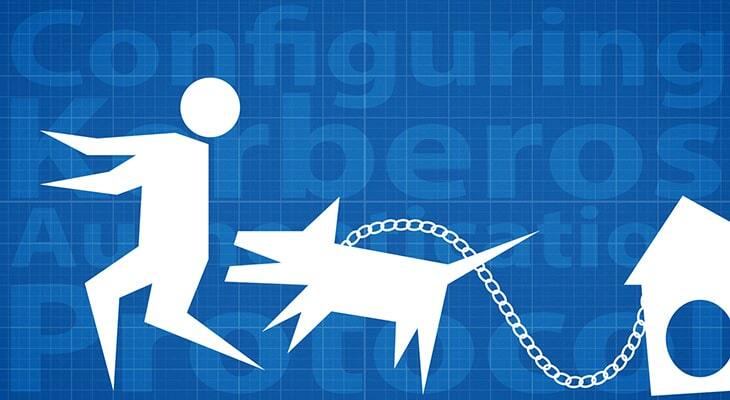 /mapuser Maps the name of the Kerberos principal, which is specified by the princ parameter, to the specified domain account. /pass Specifies a password for the principal user name. /ptype Specifies the principal type. Use KRB5_NT_PRINCIPAL. /crypto Specifies the keys that are generated in the keytab file. /out Assign a directory and a name for the output *.keytab file. -setupn Doesn’t set the user principal name along with the service principal name. You will need to transfer the keytab file to the Linux machine. On the domain controller machine, go to Active Directory Users and Computers, locate the account of the machine that you want to configure Kerberos to. In the Properties section, go to Delegation tab and select Trust this computer for delegation to specified services only and click Add. In the Users and Computers window, specify the user account that has been used to launch the database or the name of the server where the RDBMS is installed. Optionally, you can use Check names to check if a specified user or computer exists and click OK, then select a required service and click OK. Install and configure Kerberos client on your machine. sudo apt-get install krb5-user libpam-krb5 libpam-ccreds auth-client-config Edit the /etc/krb5.conf file to add the full domain name, domain controller name and the realm parameterImportant: Do not leave any comments tagged with the “#” sign in the config file. For machines on Windows OS, you don’t need to install and configure Kerberos protocol but it must be in the Active Directory domain. Also, to set service principal names the setspn command is used. Below is the example for configuring a Windows machine to connect to MS SQL Server database using AD user credentials. DataSunrise can function as an authentication proxy for cloud and on-premises databases to minimize the risks of unauthorized user access maintaining the authentication policies of Microsoft Active Directory and Kerberos protocol.